Home Sweet Trailer, originally uploaded by chrisfreeland2002. 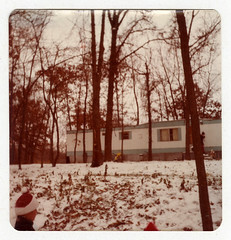 This is the trailer I lived in when I was 6mos. to 3 yrs. old. We built a house on the site the summer of my 3rd birthday and someone came and drove the trailer away. It was odd to watch the only place you knew as 'home' leaving you behind.